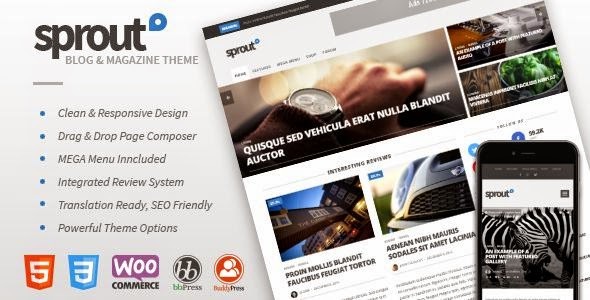 Sprout is the Modern, Clean, Responsive and Retina Ready (HD) WordPress Premium Theme built for blogs, newspapers, magazines or review sites.You can create your own shop with WooCommerce plugin, create a forums on your site with bbPress plugin and create your own social network with BuddyPress Plugin. With built in page composer, you can select the posts from the specific category, exclude the posts form categories and order by date, number of views, review score and more feature in advance post filtering option. MEGA Main Menu Display a posts under main menu. 7 Blog styles with 4-Custom Styles option. 3 Single Post Page styles with 2 Custom Styles option. Item Reviewed: Sprout Clean Blog News Magazine Responsive Theme 2015 9 out of 10 based on 10 ratings. 9 user reviews.